Drill Rating 4.5 from 2 user votes. Viewed 4530 times. 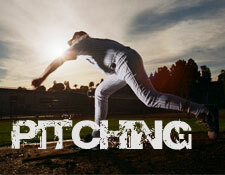 There is no special setup or equipment for this pitching mechanics drill. This pitching drill can be performed with individuals or with a partner. Have players work on pitching body mechaincs prior to the pitch. Since they are not actually releasing the ball, the players do not need a ball. Cover the following pitching body mechanics. Wide comfortable stance in landing position with back foot perpendicular to the target, front foot pointed to the target. Weight evently distributed between each leg. Head and eyes pointed to target. Elbows are at shoulder height. Palms are down with throwing hand on top of the ball. From this position have the pitcher rock back onto back foot and complete the throwing mothion. Assure proper pitching mechanics technique is being used. Have the player hold the position prior to throw and check their body posture. Back foot should remain in contact with the ground.